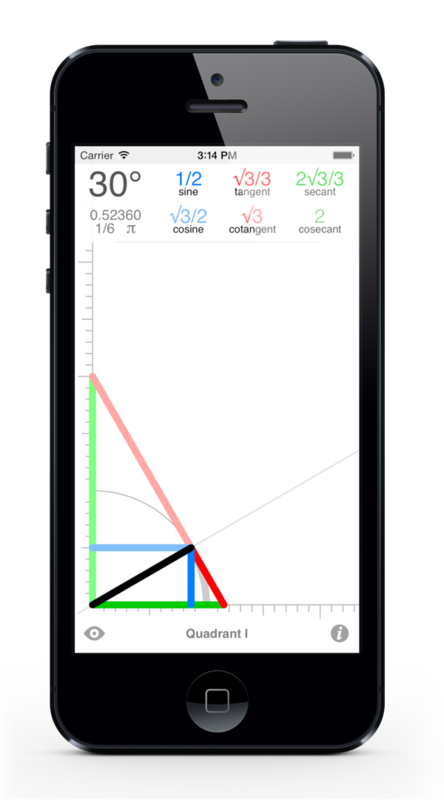 Trigger features a dynamic, touch-friendly “Complete Triangle” figure, which is, quite simply, the single greatest teaching tool for trigonometry. Representing the six trig functions as geometric segments, the Triangle fosters real, intuitive understanding of the behaviors of, and relationships among, those functions. Trigger‘s interactivity compounds these benefits visually, and its calculators allow for exploring numerically. 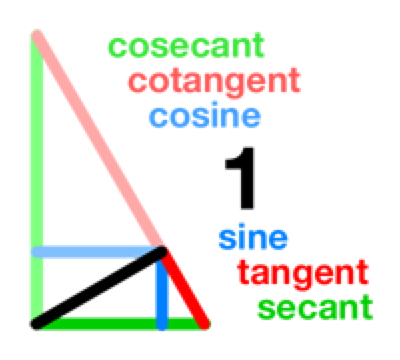 Trigger‘s info panel lists key properties of the Complete Triangle, but a fuller accounting appears in the note, (Almost) Everything You Need to Remember about Trigonometry, in One Simple Diagram, linked at right. Buy Trigger or don’t buy Trigger, but —for the love of all things triggy— read that document! ... and please buy Trigger. The Complete Triangle figure dominates Trigger’s screen. Swiping changes the figure’s defining angle&ast;, and thus also its shape. Sometimes, some segments shrink to mere points; other times, some segments extend into endless rays. The corresponding trig values —﻿the lengths of those segments— range from zero to infinity. Just a few moments with Trigger explains how —and, more-importantly, why— the segments and values behave as they do. Trigger’s top-left corner shows the Triangle’s defining angle measure, in degrees, in radians, and in “piece of pi” format (which expresses the radian measure as a multiple of pi). 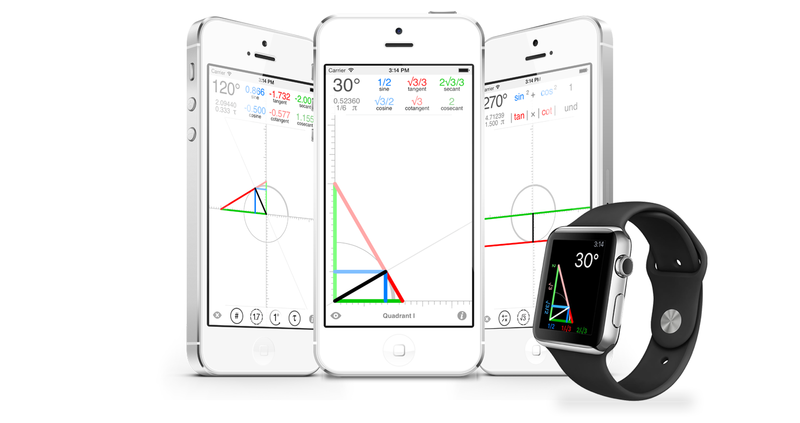 Trigger optionally displays the radian measure as a fraction of tau (aka, 2 pi). 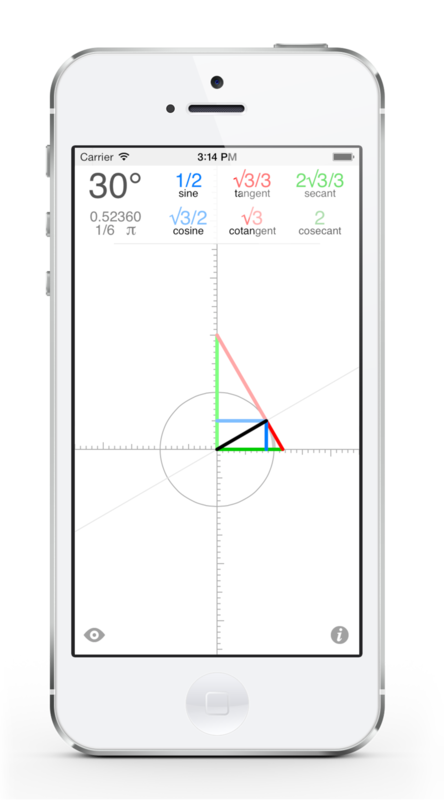 &ast; Press-and-hold a trig value in order to make swipes affect a particular segment’s length, instead of the angle. Focus your attention. 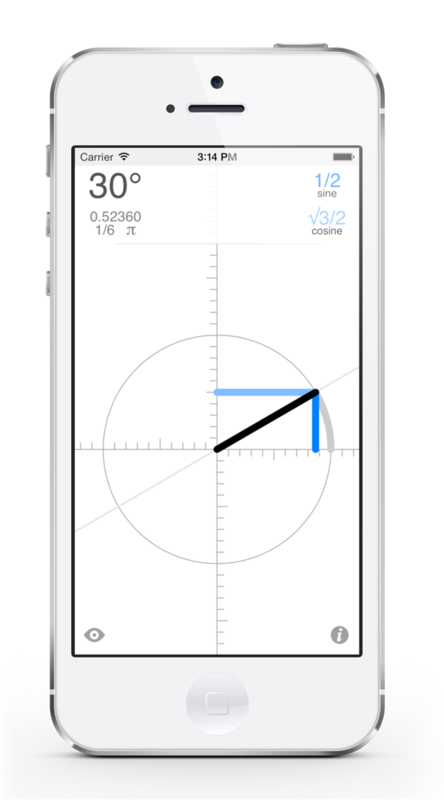 Double-tap a quadrant to zoom in, double-tap the circle to see only sine and cosine, or tap an individual trig value to hide its segment from view. 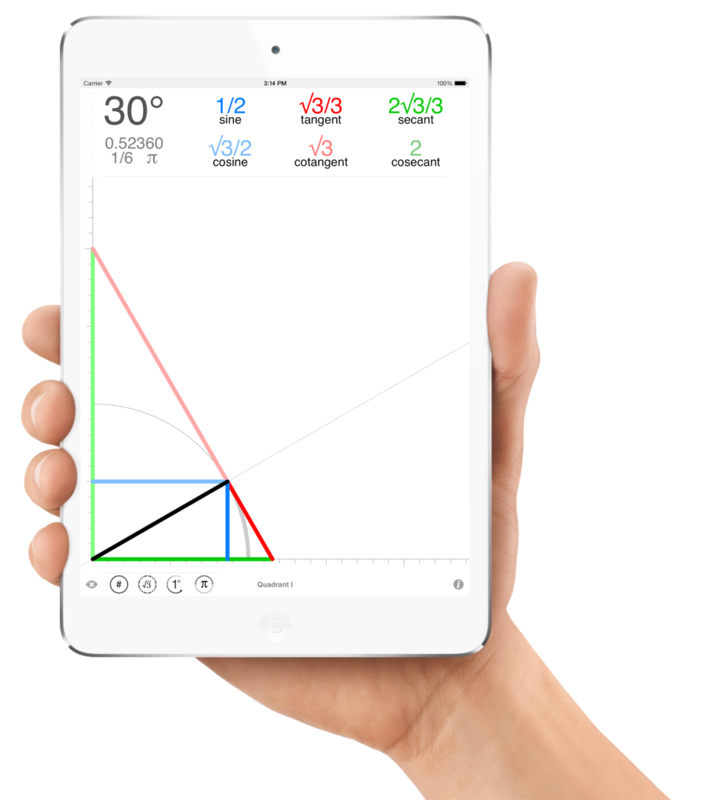 Trigger also provides a pair of calculators to explore numerical trigonometric properties. This calculator unwaveringly computes the value 1.000. The values of these calculators vary, but they always match. Of course, the geometry of the Complete Triangle explains these facts nicely. 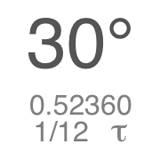 (In)Exact values at 0°, 30°, 45°, 60°, 90°. 1° vs. 5° precision for circular swipes. Radians in π (3.14...) vs. τ (6.28...). 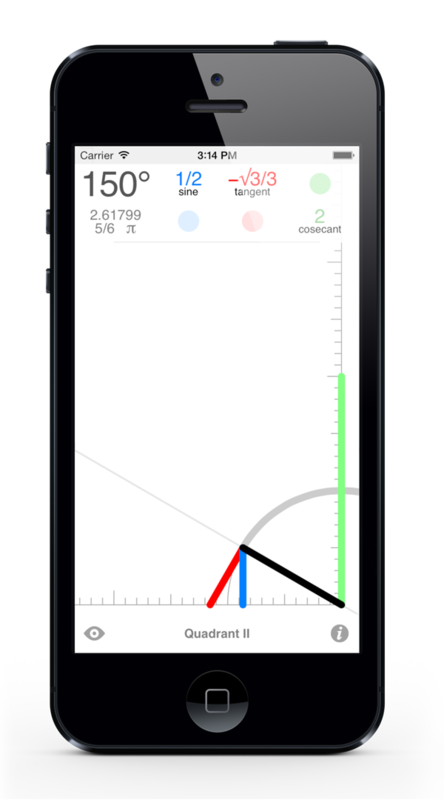 One of the first 500 apps available in the App Store on Day One&ast;, Trigger —now, Trigger 2— has been re-written, re-designed, and completely re-jiggered for modern iOS devices, bringing the Complete Triangle to the next generation of trig enthusiasts. &ast; Does anyone remember iPhone OS 2?